Difference between revisions of "Single: Let's Work"
|introduction = <b>Let's Work</b> was the second single from [[Prince]]'s fourth album [[Album: Controversy|Controversy]]. It was released three months after the album, and received release in North America and Europe. The b-side, [[Ronnie Talk To Russia]], was also taken from [[Album: Controversy|Controversy]]. |introduction = <b>Let's Work</b> was the third single (second in the US and the UK) e from [[Prince]]'s fourth album [[Album: Controversy|Controversy]]. It was released three months after the album, and received release in North America and Europe. The b-side, [[Ronnie Talk To Russia]], was also taken from [[Album: Controversy|Controversy]]. The North American 12" versions instead included [[Gotta Stop (Messin' About)]], which had previously been released as a stand-alone single in European territories. 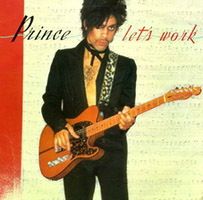 Let's Work was the third single (second in the US and the UK) e from Prince's fourth album Controversy. It was released three months after the album, and received release in North America and Europe. The b-side, Ronnie Talk To Russia, was also taken from Controversy. The North American 12" versions instead included Gotta Stop (Messin' About), which had previously been released as a stand-alone single in European territories. The single reached only number 104 on the US Billboard Pop Chart, but reached number 9 on the Billboard Soul Chart. Pairing with Controversy, Let's Work also reached number 1 for 6 consecutive weeks on the Billboard Disco Top 80 in late 1981. Prince had initially planned to release a single earlier in 1981 with the title track Let's Rock (named after a dance Prince had seen in clubs during the summer of 1981), and Prince wanted to release it as a single immediately after recording. Warner Bros. declined, and while Prince liked the track, he felt it needed to be renamed when released to avoid it seeming dated. The track, and the resulting single, were renamed Let's Work. This record wasn't released in any other format (cassette, CD, Digital). The tracklist for the Let's Rock configuration of the single is not known, although the a-side, presumably, was Let's Rock (see notes above). The single remained 10 weeks into the Billboard Soul Singles Top 40 Chart. Entry position 109 (30 Jan. 82), 107 (6 Feb. 82), exit position 104 (13 Feb. 82). This page was last modified on 17 October 2018, at 15:52.